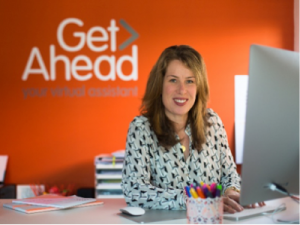 Rebecca Newenham founded Get Ahead VA in 2010 after recognising a gap in the market for virtual assistance services that offered the flexibility, value and performance that small businesses and start-ups need in the 21st century, digital economy. The business has won a variety of awards including Flexible Business of the Year in the Mum and Working Awards and Theo Paphitis’ Small Business Sunday #SBS Award. It has also been shortlisted in awards for Talent Attraction and Networking and was selected as one of the best Home Businesses in the UK. Rebecca, what have been your highlights so far? What advice would you give to other people thinking about starting their own business? You can find out more about Get Ahead VA by visiting their website or following them on Twitter and LinkedIn.